Call 831-427-3500 to make an appointment at the Santa Cruz Women’s Health Center or the East Cliff Family Health Center. It is our intention to provide needed services to women and children of all races, classes, religions, physical abilities, cultures, ages and sexual orientations. The building is wheelchair accessible. We have bilingual staff and providers for Spanish-speaking clients. Please let us know if you have special accessibility needs and we will try to meet them. 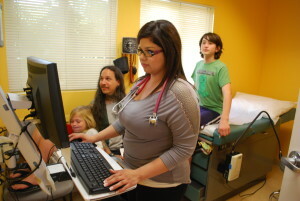 We accept most insurance, including Medi-Cal, MediCare, Healthy Kids, Anthem Blue Cross, Blue Shield, and Health Net. We offer a sliding scale discount to all uninsured and underinsured patients. Office visit fees range from $0-30, based on your income level and the number of members in your household. All patients will be served regardless of ability to pay. Family PACT: birth control, sexually transmitted infection testing and treatment, pregnancy testing, annual exams, and related services.